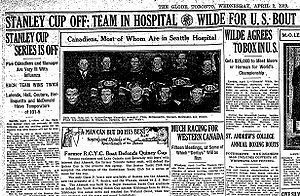 The 1919 Stanley Cup Final ice hockey play-off series to determine the 1919 Stanley Cup champion ended with no champion decided, being suspended after five games had been played due to an outbreak of Spanish Influenza. This was the first and, as of 2009, only time since its donation in 1893 that the Stanley Cup was not awarded after the playoffs began. Hosting the series in Seattle was the Pacific Coast Hockey Association (PCHA) champion Seattle Metropolitans (Mets) playing off against the National Hockey League (NHL) champion Montreal Canadiens. Both teams had won two games, lost two, and tied one before health officials were forced to cancel the deciding game of the series. The entire Canadiens team and its manager George Kennedy fell ill with the flu and were hospitalized. The flu would eventually claim the life of Canadiens' defenseman Joe Hall four days later. Kennedy was permanently weakened by his illness, and it led to his death a few years later. The sixth and deciding game of the series was scheduled for April 1, but the epidemic of Spanish Influenza caused several players on both teams to become seriously ill. With Lalonde, Hall, Coutu, Berlinguette and McDonald of Montreal hospitalized or sick in bed, with fevers between 101 to 105 degrees Fahrenheit, game six was canceled just 5.5 hours before it was scheduled to start. Kennedy said he was forfeiting the Cup to Seattle, but Pete Muldoon, manager-coach of the Metropolitans, refused to accept the Cup in a forfeiture, seeing that it was catastrophic illness that had caused the Canadiens lineup to be short of players. Kennedy asked to use players from the Victoria team of the PCHA and president Frank Patrick refused the request. Five days later, Joe Hall died of pneumonia brought about by the flu. His funeral was held in Vancouver on April 8, with most team members attending, and he was buried in Brandon, Manitoba. Manager George Kennedy also was stricken. His condition declined and his wife arrived from Montreal to be with him. He seemed to recover and was released from the hospital, but he never fully recovered and he died a few years later. Much of the world is worry (sensationalizing?) this new Swine Flu epidemic. When the World Health Organization issues a pandemic alert it must be serious. This Swine Flue apparently has potential to be something significant. This flu has something called a H1N1 virus. H1N1 was the key ingredient in the "Spanish Flu" of 1918 and 1919 that is estimated to have killed as many as 100 million people world wide. There was another casualty of that famous flu - the Stanley Cup. The NHL actually had to end the Stanley Cup finals before a winner could be declared. Prior to the 2004-05 lockout season it was the only time the Stanley Cup was not awarded. The decisive sixth game was to supposed to decide the winner, as the Montreal Canadiens and Seattle Metropolitans battled to two wins a piece with one tied game. The game was to be played in Seattle. The Montreal Canadiens could not ice a full team for the game, as Joe Hall, Louis Berlinquette, Billy Coutu, Jack McDonald and manager George Kennedy were all in hospital. With the Canadiens short players, Kennedy tried to borrow PCHA players from nearby Victoria. Frank Patrick refused any such request. Knowing he could not ice a team, Kennedy felt he had no choice but to forfeit the Stanley Cup to Seattle. But Mets coach Pete Muldoon refused to accept the Cup under such dire circumstances. No winner was declared. 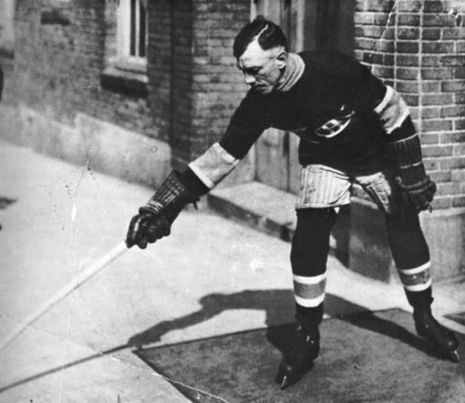 Hall died of flu-related pneumonia five days after the game was supposed to have taken place. Kennedy survived, but was said to have never been healthy again. He died in 1921.